How to write a letter to your future self. I've been writing email capsules to myself since I was 14 years old and a freshman in high school! I remember having had a really rough year, adjusting to the petty drama of high school and realizing that being a nice person doesn't exactly guarantee that everyone will be nice to you. When I discovered email capsules at the end of my freshman year, I was really excited to have the opportunity to write a letter to myself and not be able to look at it again until later in the future. It was so interesting to open that email and realize that the things that were once so major and affecting to me, had absolutely no relevance in a year. It was then that I decided that I would make this a tradition...sending letters to my future self, going on 9 years now! Though my first email was a bit short, they got lengthier over the years. In these letters, I've always talked about what is important to me at the time...from what major events are coming up..like my Sweet Sixteen and deciding on what college to attend, to what my personal style or music taste is like at the time. It has been so amazing to see how much I've evolved and grown as as a person in these last 9 years. Even the way I type is different (thank God)! Most importantly, these email capsules have taught me that life goes on. That guy that hurt you when you were 16, most likely didn't hold any importance to your 23 year old self. Since I've started writing these emails, I've graduated from high school and college and am now almost 6 months into my first career job as a marketing coordinator! Sometimes it scares me how fast time goes by, but it gives me a little bit of comfort to know that I can always look back at my email capsules to relive the memories for a few moments! 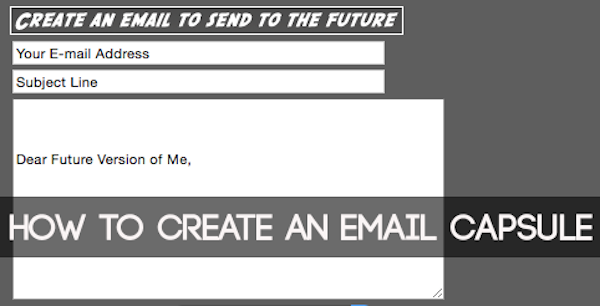 Since I've started doing this in 2007, there have been many websites created that allow you to send an email to the future, even up to 100 years from now! I've always used the Cyber Time Machine which can be found HERE. Whether you're going through a stressful time or a wonderful time in your life, I always recommend everyone to capture the feelings, ideas of your current self in an email capsule and enjoy a good laugh/cry while reading it in the future!